One of the more popular management techniques taught in business schools is the Japanese concept of Kaizen. Kaizen refers to a philosophy of continuous improvement that, when applied to business situations, leads managers to relentlessly focus on enhancing the effectiveness of all functions within an organization from the executive suite to the factory floor. By consistently applying Kaizen, Japanese businesses were able to play a key role in rebuilding their country’s economy after World War II. At each stage of Japan’s post-war economic recovery, businesses were “pleased, but not satisfied” with the results and constantly pushed for more improvement. The concept of Kaizen seems to have close parallels with the business and management philosophy expressed in Pleased But Not Satisfied by David L. Sokol. David Sokol has been in the news many times over the past few months due to his increasing prominence within Berkshire Hathaway. Mr. Sokol is Chairman of MidAmerican Energy which is one of Berkshire’s most important subsidiaries. In addition, he has assumed the Chairman and CEO roles at NetJets, a Berkshire subsidiary that has suffered from serious operational problems during the current economic downturn. Many followers of Berkshire Hathaway believe that Mr. Sokol may be on the short list to eventually succeed Warren Buffett as CEO. It is only natural for shareholders to be curious about Mr. Sokol’s approach to management. Mr. Sokol has succeeded in creating a very concise guide to his business philosophy that can be read easily in only a couple of hours. After providing a brief account of his background in business, Mr. Sokol sets forth the “six commandments” of business: Customer Commitment, Employee Commitment, Financial Strength, Integrity, Environmental Respect, and Operational Excellence. While many of his examples are related to MidAmerican’s business, these principles apply equally to any business. 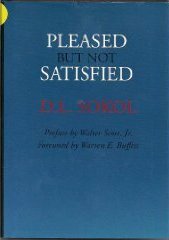 One aspect of Mr. Sokol’s management philosophy that is reinforced throughout the book is the importance of accountability for those in management roles, particularly when it comes to the responsibility managers have toward their direct reports. Managers who engage in lazy behavior such as granting all of their employees similar scores on generic performance reviews or “punt” when it comes to supervision by saying they do not “micromanage” are not only harming the business but doing a disservice to employees looking to them for leadership. Goal setting, budgeting, and actively measuring results receives quite a bit of attention, and rightly so. Mr. Sokol’s recommendation to carefully plan, execute, measure, and correct throughout a project may seem obvious but it is definitely the exception rather than the rule in most organizations. The very subject of performance metrics can cause a revolt among under performers in an organization who will protest that their jobs are too “complex” or the industry is too “dynamic” for metrics to be established. Such individuals exist in every organization but have no role in a system that is seeking continuous improvement. Metrics are critical because, in most organizations, what is measured is what gets the attention of managers and employees. By setting key performance indicators at the corporate level and having each operating unit do the same, managers can clearly communicate what is important and what is not. In my experience, great employees will welcome measurement and be motivated by scorecards while poor employees will object. Mr. Sokol’s recommendation to always measure against a plan and to correct for changing assumptions and events can improve the results of any organization. One of the main jobs of Berkshire Hathaway’s CEO is to allocate capital. At Berkshire, this is no small task due to the large amounts of cash flow generated by the operating companies that regularly flow to headquarters for reallocation to other operating companies, purchase of entire businesses, or deployment in publicly traded securities. As a result, Berkshire Hathaway shareholders will want to pay particular attention to Mr. Sokol’s chapter on acquisitions and business expansion. How Did Berkshire Hathaway’s Book Value Fare in Q3?